The Tobacco Valley Board of History is a nonprofit that raises funds to cover the costs – and there are many – for maintaining the Historical Village. They make sure the buildings are in good repair with sound roofs, and are nicely painted. They arrange for lawn maintenance each summer so the grounds look beautiful for the Quilt Show and Shakespeare in the Park. They keep the exhibits organized and the archives up to date. 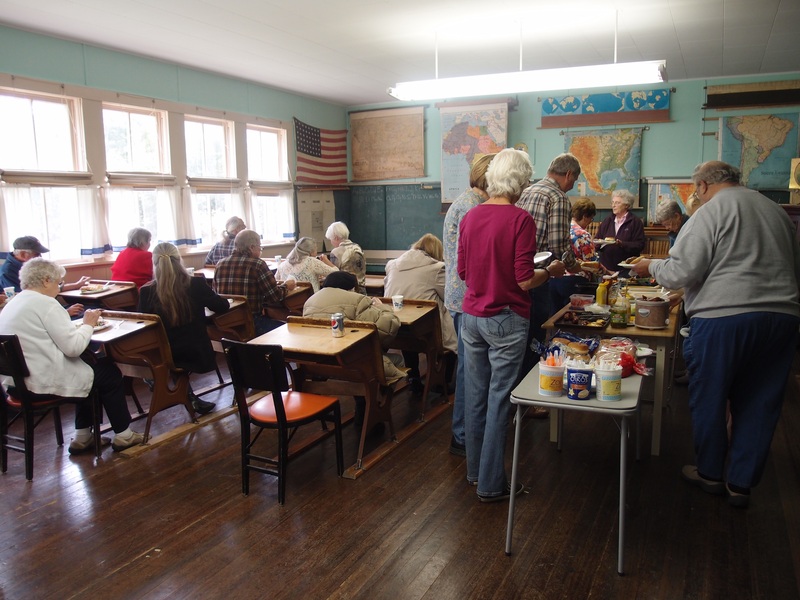 Members of the board and other volunteers raise the funds to do all of this through memberships, quilting, the annual Dinner on the Lake, rummage sales and such. This week though there is a new fundraiser and an easy way for you to help support the Village. HA) Brewery and Jax Pizza are hosting a Community Pint Night on Tuesday, September 22. If you come out to the brewery on Grave Creek, $1 from every beverage and $2 from every large pizza sold that evening will go towards the Historical Village. And to make it even sweeter, Connie Deebel and Friends will be providing awesome music there. So a delightful evening and a great cause. Put it on your calendar and stop by. And remember to thank HA) and Jax for helping with this community support. It is official. Fall is here. Not perhaps according to the calendar but according to the rhythm of the Historical VIllage. We had a lovely indoor picnic (weather was threatening rain) on Wednesday to celebrate all the volunteers. The museum will close for the season this coming Monday. The blue quilt is finally done! Now we can start to prepare for the rummage sale in a few weeks. 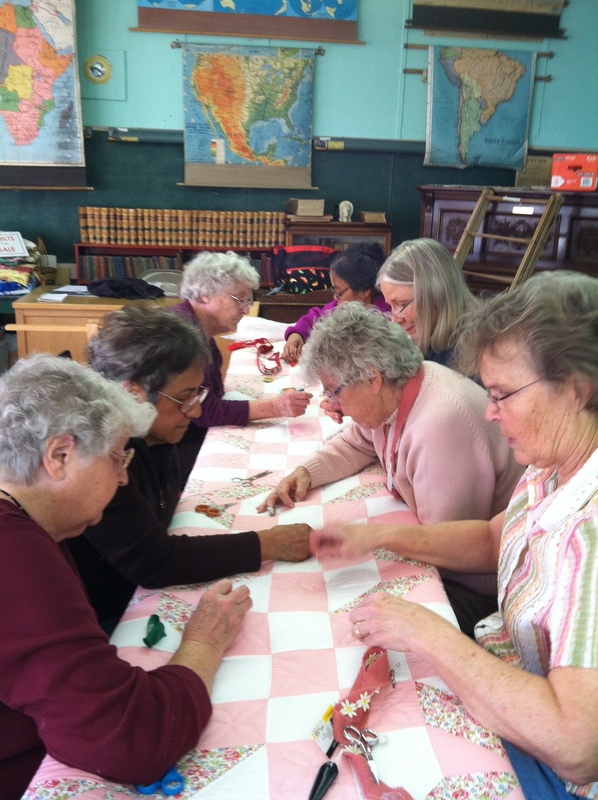 After that we will seriously get back into our schedule of quilting every Friday from 10:00 to 3:00. I for one am looking forward to it. I appreciate that time every week to spend in the Village. I appreciate the time with the quilters. I have even decided to cut back on my regular job so that I can have Fridays free. In life we need to make decisions about what is valuable. Yes, of course there are some things that need to be done regardless. I need to take time to wash dishes and pay the bills. I try to get enough sleep and to exercise. But there are those other hours in the day, week, month, year which are more flexible. Do I want to quilt on Friday or sit in front of a computer all day? Am I willing to tighten my budget so I can visit with these women a bit each week around the quilting frame? And the answer – at least for me – is that I do want to spend time in the old school house listening to their stories and advice. I want to learn more about our valley’s history. I want to be able to answer at least some of the questions tourists stop by to ask.